An out-of-town gem, with spellbinding views of rice terraces and volcanoes, Mandalay Hideaway offers a true escape. 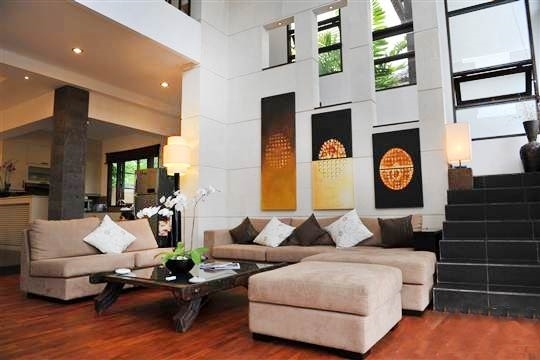 This elegant 2-bedroom house is enhanced with modern furnishings and cherished antiques, numerous high-tech facilities, a swimming pool and dedicated spa room, plus the inclusive services of a concierge, butlers, chef, car and driver. 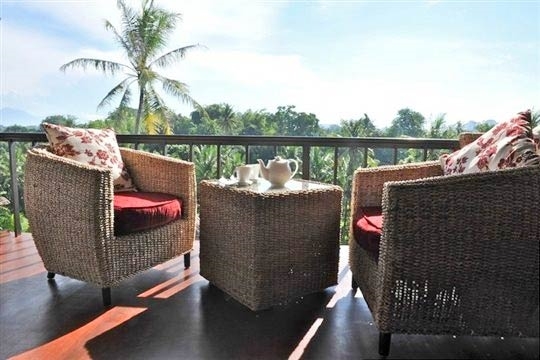 Perhaps the most pervading image of Bali is the endless panorama of emerald rice fields. Yet, in the south of the island, as the codependent marriage with tourism has matured, the once-swaying cereal seas have sharply diminished under a floodtide of commercial and residential development, meaning that those with a keen sense of appreciation for the wonders and romance of nature have to travel further to find their aesthetic nourishment. 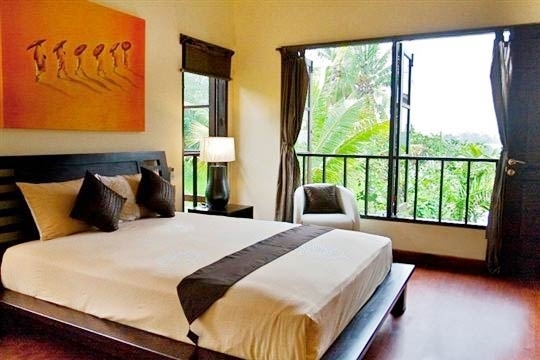 The two-bedroom Mandalay Hideaway feeds that hunger in spades. 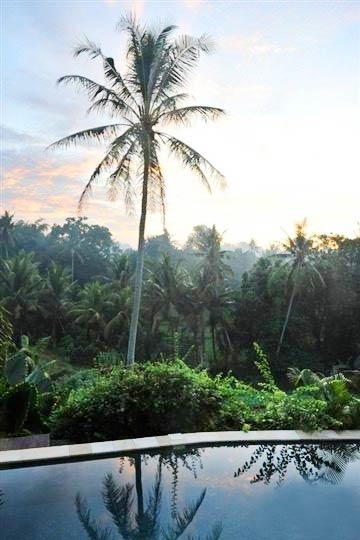 Located a sober 21 kilometres from Seminyak in a hidden river valley far from the crowds, the villa offers a humble-yet-spectacular experience of working rice terraces, village life and palm-fringed river views. This small-but-perfectly-formed, two-storey villa is meticulously maintained and furnished with all the creature comforts of home; with the added advantage of sunny weather, a swimming pool, sunloungers on the lawn, a spa room and, of course, the million-dollar surroundings that some actually pay a million dollars to enjoy. Night time is quiet as a mouse’s house and after a great night’s sleep you will wake to the splendid vista of volcanoes and the morning chatter of birds mixed with the gentle flow of the river. 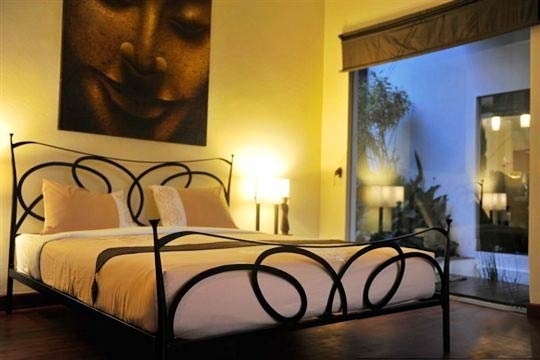 Days are spent being waited on hand and foot by a large contingent of friendly staff (meals are prepared by a professional chef from a fixed-price menu), and if hanging easy gets wearisome you can also enjoy privileged membership of the Canggu Club, which offers great sporting and social facilities, as well as nice discounts on F&B at Alila Villas Soori Resort and on green fees at the Nirwana Bali Golf Course. At Mandalay Hideaway, you will find explicit instructions for ALL the electronic media appliances (There is a God!) and if there are no guests due on your date of departure, checkout time is at your discretion. It is, after all, the little things that make one feel special and these guys go the extra distance to get it just right. It’s no secret, just ask and you will receive the serenity and relaxation that you know deep down you truly desire but were just too afraid to hope for. Spectacular view of rice terraces, volcanoes, and palm-fringed river valley. How many times have you been bamboozled to the point of screaming blue murder with the mass of remote controls presented before you in a strange new place? No problems here. 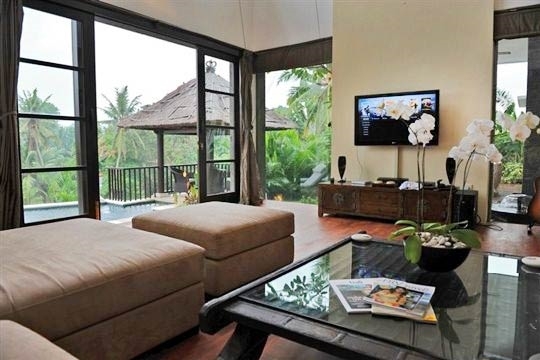 The thoughtful owners of this villa have written out instructions for each and every appliance (Apple TV, DVD, Blu-Ray, Indovision satellite channels, PlayStation and the sound system) in intricate detail, laminated them and given them a leather bound folder along with a library of every movie and DVD in the house to make new-media-stress a non-starter. What a joy! The staff (concierge, personal butlers, chef) are all professionally trained and as discrete as you instruct them to be. All we had to do was push the service button in the balé (and in every room) and there they were, smiling and ready to please. Think twice about having a treatment in the spa room, however; massages here are so good that you run the risk of calling the therapist back every single day for more, threatening to put a dent in your wallet. The beauty of the rice terraces, coconut palms, river and (on clear mornings and evenings) the mountains, were what got us the most though; they seemed so close you could almost reach out and touch them. Simply the views and the intimacy of the surroundings. Close enough to town for a good night out, but far enough away to serve you up a personal slice of nature and allow you to truly leave your worldly woes behind. In terms of facilities, this is one of the best equipped villas we have ever stayed in. The owners have thought of everything from a catalogued library of DVDs to a mobile phone charged up and ready for guest use. The villa’s tie-ups with Alila Soori and Pan-Pacific Nirwana Golf, as well as membership of the Canggu Club give guests more things to do and experience than they could manage in a month of Sundays. We certainly couldn’t find anything to complain about, although we felt that if six adults stayed here (using the spa room as a third bedroom) the villa could feel a bit small. On the other hand it’s great to have that choice available. Mandalay Hideaway is located in a jungle and rice field setting within a Balinese village, with no restaurants, bars or shopping in the immediate vicinity. That said, the villa offers a wonderful opportunity to wander through the rice fields and the village to get a slice of local life. A car is essential, so guests will be happy to learn that the services of a car and driver are inclusive in the price. 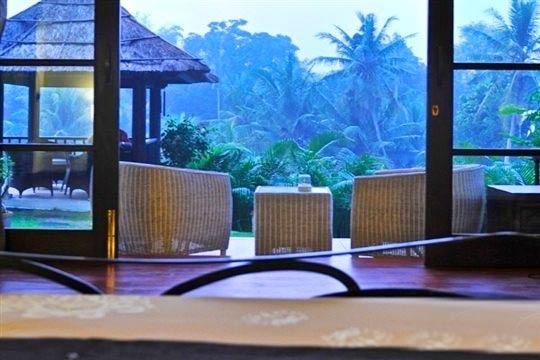 Within eight kilometres is a windswept stretch of coastline and a number of resorts with world class facilities and restaurants, as well as the Nirwana Bali Golf Club – a great place to spend a morning – and the famous sea Temple of Tanah Lot, perhaps one of Bali’s most well-visited and venerated holy sites. 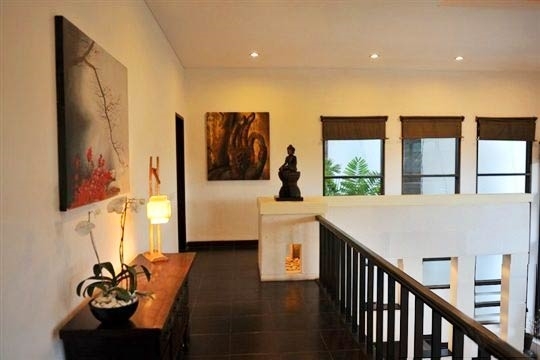 Mandalay Hideaway is a modern house, built in 2003, then lovingly renovated, furnished, and adorned with Asian antiques by the new owners in 2010. The building is entered via a deck over an ornamental pond, and on one side of this is the spa room, featuring doors that open to the garden and a small terrace with chairs. 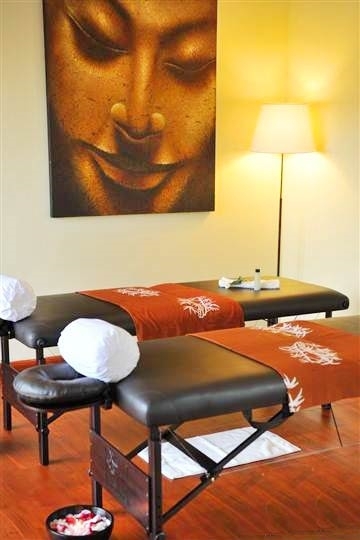 The room is equipped with two massage tables, a satellite-channel TV and iPod dock. There is also a dressing room and ensuite bathroom fitted with a walk-in shower. This room can be converted into a third bedroom if required. On the other side of the pond is the entrance to the living room, complete with a well-equipped open-plan kitchen and dining area on a slightly elevated level. 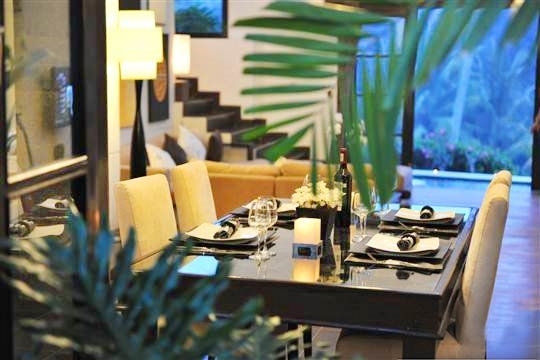 Outside is a private courtyard for alfresco dining, with a table for six shaded by an umbrella. The indoor dining space is also furnished with a table for six and cabinets filled with a collection of unique glassware. The living area extends the full height of the house and presents stylish-yet-comfortable modern sofas and ottomans and a state-of-the-art entertainment system with a 42-inch satellite-channel TV, Blu-ray disc player, and Playstation 3. 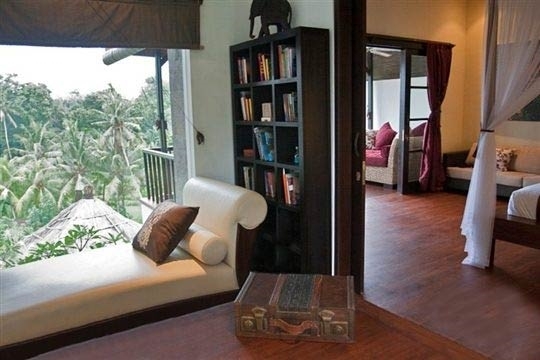 A stone-tiled staircase leads up to a gallery where, tucked in a corner outside the master bedroom is a desk, a huge comfy office chair, laptop computer and printer/scanner for guest use, a chaise longue, some board games and a library of nearly 200 books, including guidebooks to Bali. The master bedroom is furnished with a sofa and a four-poster queen bed, and cooled by a choice of air-conditioning or ceiling fan. 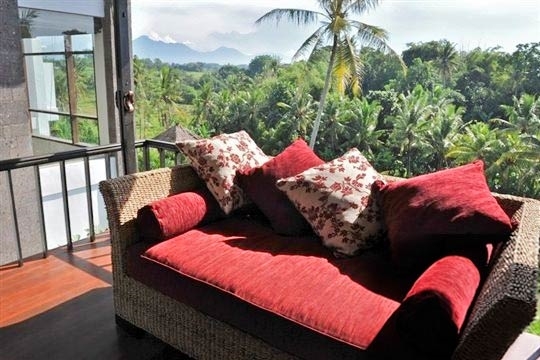 Doors open to a charming balcony with a sofa and chairs crafted in water-hyacinth, and a glorious view of rice terraces, the river and the mountains. Additionally, there is a walk-in dressing room, while the ensuite marble bathroom boasts a slatted wooden non-slip floor covering, a bathtub and walk-in shower. The second bedroom is similar, albeit without the balcony, furnished with a double bed, a dressing room and a small bathroom with a shower. Both bedrooms are equipped with iPod docks. In the garden is an eight-metre swimming pool, flanked by a delightful balé relaxation pavilion (great for breakfast) and sunloungers on the lawn. 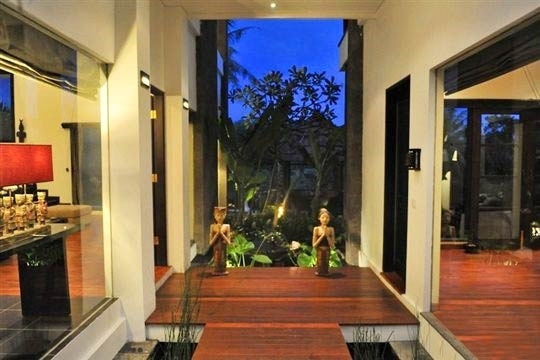 2 bedroom villa located in Tabanan, Bali. Ideal for Beach in ten, Body and soul, Kid friendly, Going for golf, Fair share for groups, The great outdoors, Romantic retreats, Sensible for seniors, Room with a view.